Oregon’s 2nd Congressional District is big. It takes hours to drive across it. Do you know who doesn’t have trouble getting around our district – and the rest of the state? Senator Ron Wyden! Get there early to settle in, but no more than an hour early. Please keep in mind that the Sisters event is at a high school and it is still a school day. Generally around an hour and a half. The Sisters town hall is expected to end around 7pm. 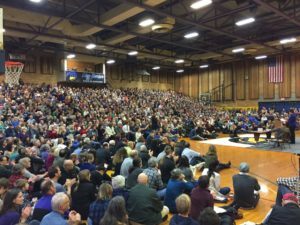 For the Wyden town halls, you will receive a ticket – like a raffle ticket- on entering and the last three numbers will be called. A microphone will be brought to the person holding that ticket to ask a question. What is the capacity of the auditorium? In Sisters, around 650 people – and we expect to see it filled. Follow us on Facebook and Twitter or contact us and ask to be added to our mailing list! Also be sure to add Senator Ron Wyden if you’re on Facebook or Twitter and want to hear how he’s fighting for you every day! Senator Ron Wyden, Town Hall. Bookmark.